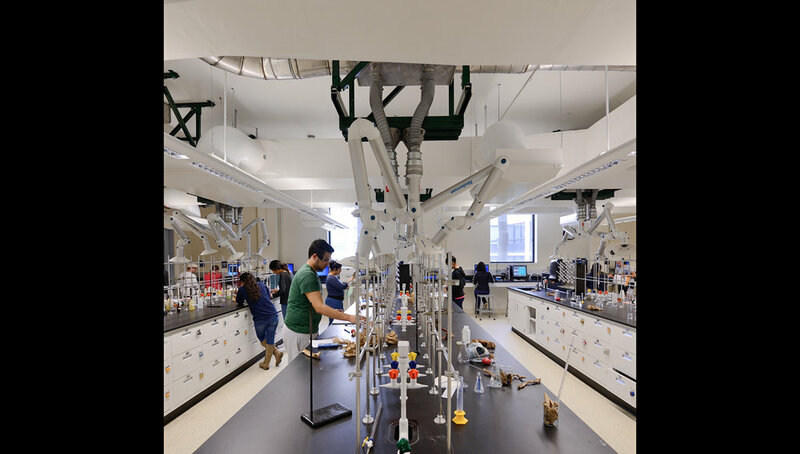 Rutgers University renovated an existing 3,000+/‐ square foot chemistry teaching laboratory in Olson Hall. The new laboratory includes updated ventilation, new casework and fume hoods and fume extractor arms. New windows were cut into the existing corridor and exterior walls, providing natural light into the space as well as becoming a prominent feature at the first floor entry. Space was provided for computer workstations along the exterior wall, which relieved the overcrowding of the existing computer room. Special coordination was required to bring the new fume hood exhaust to the roof through an existing four‐story functioning laboratory building. A new high volume exhaust fan installed on the roof replaced the existing multiple exhaust fans that were previously serving the room.